 Purnell P R, Mack P C, Tepper C G, et al. 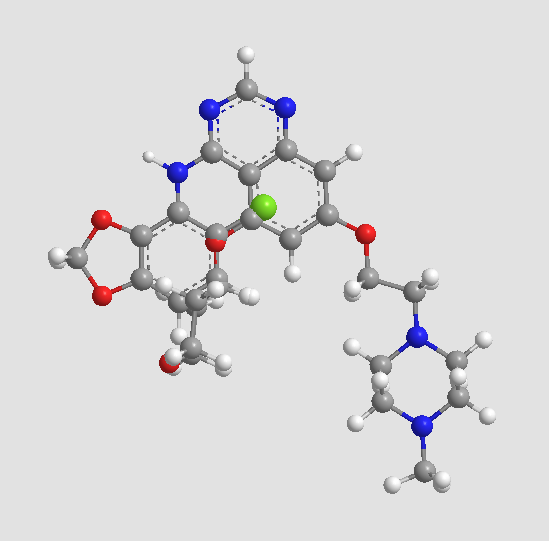 The Src inhibitor AZD0530 blocks invasion and may act as a radiosensitizer in lung cancer cells. Journal of thoracic oncology: official publication of the International Association for the Study of Lung Cancer, 2009, 4(4): 448. Rajeshkumar N V, Tan A C, De Oliveira E, et al. Antitumor effects and biomarkers of activity of AZD0530, a Src inhibitor, in pancreatic cancer. Clinical Cancer Research, 2009, 15(12): 4138-4146. 1. Saracatinib (AZD0530) is a potent modulator of ABCB1-mediated multidrug resistance in vitro and in vivo. Int J Cancer. 2013 Jan 1;132(1):224-35. doi: 10.1002/ijc.27649. Epub 2012 Jun 13. Saracatinib is a dual Src/Abl inhibitor that inhibits ABCB1 transport function and hence reverses ABCB1-mediated MDR without affecting ABCB1 expression or AKT phosphorylation. 2. 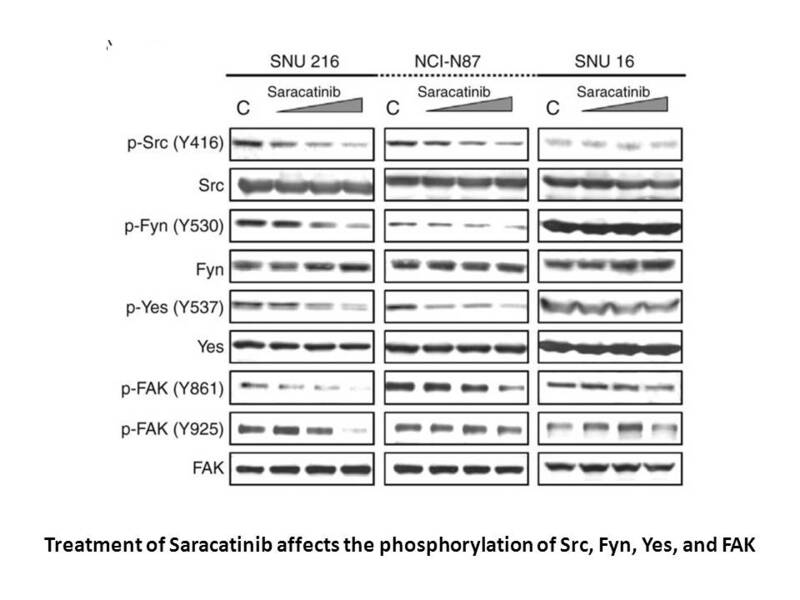 First report of the safety, tolerability, and pharmacokinetics of the Src kinase inhibitor saracatinib (AZD0530) in Japanese patients with advanced solid tumours. Invest New Drugs. 2013 Feb;31(1):108-14. doi: 10.1007/s10637-012-9809-7. Epub 2012 Mar 14. Saracatinib is a Src inhibitor with antitumor activity. 3. 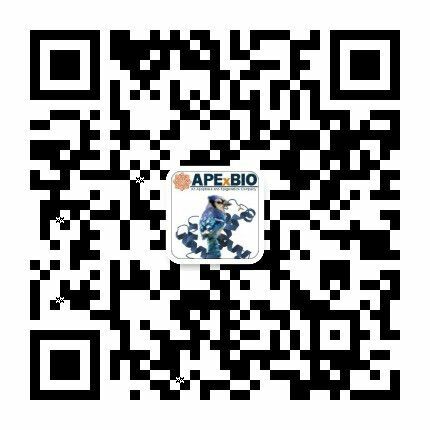 Antitumor activity of saracatinib (AZD0530), a c-Src/Abl kinase inhibitor, alone or in combination with chemotherapeutic agents in gastric cancer. Mol Cancer Ther. 2013 Jan;12(1):16-26. doi: 10.1158/1535-7163.MCT-12-0109. Epub 2012 Nov 9. 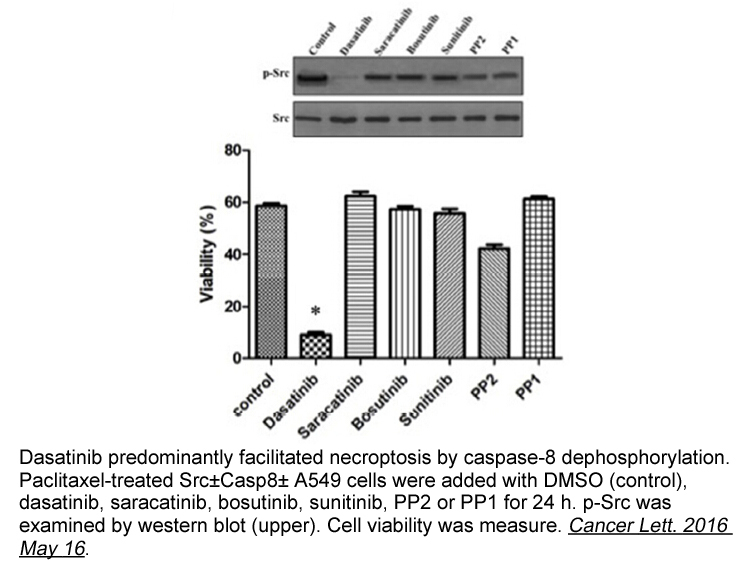 Saracatinib is a c-Src/Abl kinase inhibitor that inhibited the growth and migration/invasion of gastric cancer cells through inhibiting a few signaling pathways, arresting cell cycle at G(1) phase and inducing Bim-mediated apoptosis. The combination of saracatinib with other chemotherapeutic agents exhibited enhanced anti-gastric cancer activities. 4. 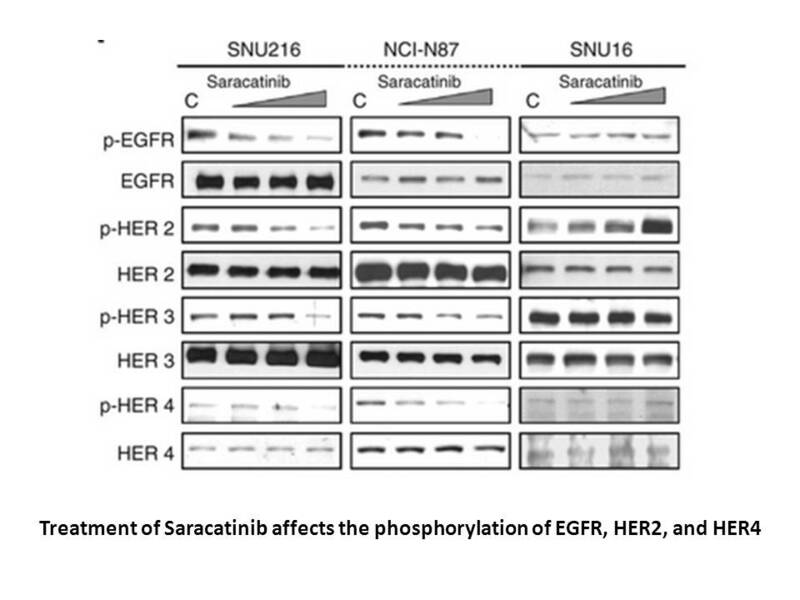 The ErbB2-targeting antibody trastuzumab and the small-molecule SRC inhibitor saracatinib synergistically inhibit ErbB2-overexpressing gastric cancer. MAbs. 2014 Mar 1;6(2):403-8. doi: 10.4161/mabs.27443. Epub 2013 Dec 9. The combination of trastuzumab and saracatinib, a SRC inhibitor, synergistically inhibited cell growth and potently reduced phosphorylation of Erb and AKT in both NCI-N87 and NCI-N87R gastric cancer cell lines. 5. Antitumor activity of Src inhibitor saracatinib (AZD-0530) in preclinical models of biliary tract carcinomas. Mol Cancer Ther. 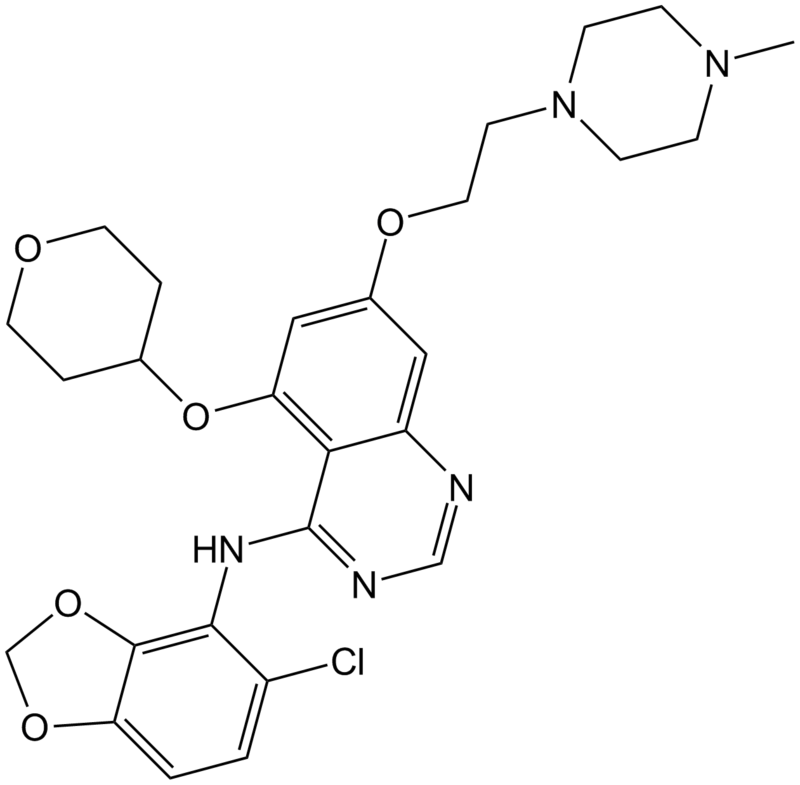 2012 Jul;11(7):1528-38. doi: 10.1158/1535-7163.MCT-11-1020. Epub 2012 Mar 27. 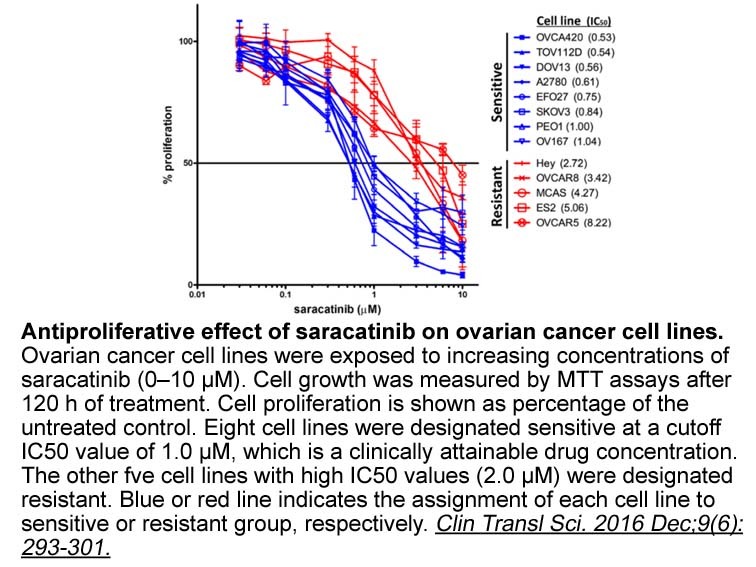 Saracatinib, a Src inhibitor, inhibited proliferation of BTC cells and delayed tumor growth in xenograft models. Chang YM1,?Bai L,?Liu S,?Yang JC,?Kung HJ,?Evans CP. Src family kinase oncogenic potential and pathways in prostate cancer as revealed by AZD0530. Oncogene. ?2008 Oct 23;27(49):6365-75.